One can only guess at the sort of fee that a star like Jack Nicholson commands for a film role these days but back in the mid ’60s he was pretty much a gun for hire. In 1963 he co-starred with Boris Karloff in a dubious sounding outing called The Terror, produced and directed by B-grade movie maven Roger Corman. The following year he shot an adventure movie called Flight to Fury directed by Monte Hellman who had also worked on The Terror. He even tried his hand at scriptwriting with a bleak as buckshot western called Ride In the Whirlwind which he and Hellman took to Corman for financing, only to be told that they could have the money on the proviso that they shoot another western at the same time. It was an offer they couldn’t refuse. Using the same startling painted desert locations around Kanab in Utah, and pretty much the same cast and crew, the pair filmed the two low budget movies back to back. 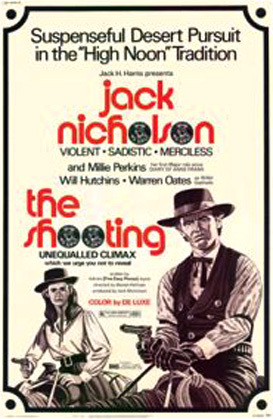 In The Shooting Nicholson plays Billy Spears, a hardened vigilante in a nifty black ensemble. In his own film, he plays Wes, a goofy cowpoke from Waco, Texas who gets taken in by an outlaw (Harry Dean Stanton) only to be mistaken for one of his gang’s members. The shrill and feisty Millie Perkins also appears in both films, first as Billy’s impetuous employer, then as the humble daughter of a pioneer family. Hellman handles the two movies with a slow and steady grip, lingering on seemingly irrelevant shots to achieve a sense of naturalism not seen in many shoot-’em-up westerns. With this unusual approach, he gained a certain cult status in Europe and Quentin Tarantino was also cited as a big fan. But what’s really attractive about this double feature is watching the 28 year old Nicholson honing his craft and doing his best to outshine the spectacular scenery.